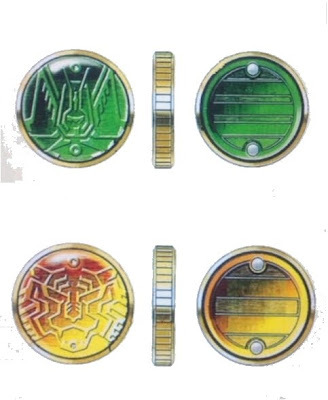 The Next Kamen Rider will have a Medals/Animal motif. His base form, Tri Form, is formed from the Hawk Medal (Red Head), Tiger Medal (Yellow Body) and Hopper Medal (Green Legs). Links' belt. Transforms him into Links by placing 3 Medals in the belt buckle. The belt has attached to it the "MedalHolder" and "MedalScanner". The toy comes with the Hawk, Tiger, Hopper, Lion, Cheetah and Finish Medals. The Finish Medal is loaded into the Medal Scanner to activate Links' finishing move in any form. A sword that can load 3 medals at a time. 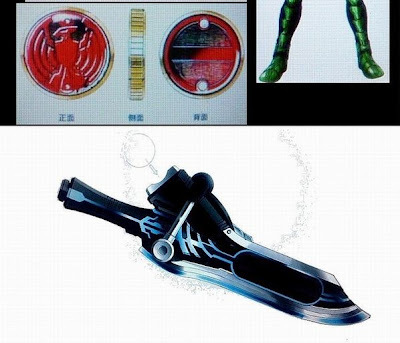 Toy comes with Kuwagata and Mantis Medals. A set consisting of Hawk, Lion, and Kuwagata helper animals. They are like the Memory Gadgets, activated by medals. They can grow big and help Links in combat. More of them will be released. The first toy set of 3 will come with the Crow and Eagle Medals. is it just me, or does the sword look like the engine blade?